I've been wanting to read this series for years and thanks to Amazon's new Unlimited program, I was able to read this one. I will say that I was a little disappointed as it was a little too easily figured out. I knew who the murder was and why pretty much early on and I was just simply expecting a little more I suppose. 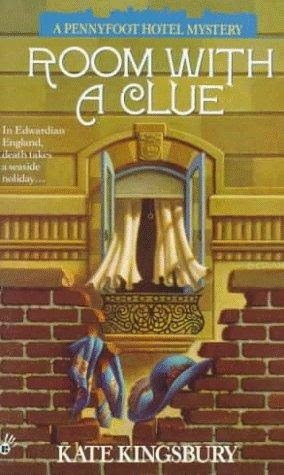 I will say that it is a quaint English mystery that is the true definition of a cozy mystery. I will say that the setting and the characters were a treat, but that the mystery was a little too easily solved for my taste. It was easy to get lost in the scenery of a quaint seaside English town that is known for being a vacation spot for the wealthy. It was also set in one of my favorite historical periods, the Edwardian era, which is what caught my eye in the first place. The main character Cecily seems like she has a lot of gumption and that I could really come to enjoy reading about her detective escapades. Unfortunately, this book was too short to really get a feel for the characters and to see if this is a series I could really enjoy. While the first book in this series was not like I was expecting, I think I will read a couple more to see if I want to continue with this series. I love the time period and that it is a cozy mystery series I could come to enjoy with time. This series has been around for some time and has some notoriety as it has been around for quite some time. I would love to see how you guys enjoyed this series and see if you had the same reaction. Disclaimer: This book was received from Amazon Unlimited. I reviewed this book without compensation of any kind. All thoughts and opinions are solely mine. I read the second book in the series and it wasn't what I was expecting or what I cared to read. I highly recommend the Mrs. Jeffries mysteries. They're fun. I've read several of these and liked them, but didn't keep reading the series for some reason (probably because my library only had some, and I was on a tight book budget at the time.) They were sometimes easy to figure out, but I liked the main character.